Summary: Mote’s Sea Turtle Rehabilitation Hospital has been rehabilitating Florida sea turtles since 1995. During that time we have admitted and cared for over 250 sea turtles. On average Mote admits and cares for over 20 animals per year from all over the state of Florida. Radiology is a primary diagnostic tool for sea turtles, yet most rehabilitation institutions, including Mote, have radiological technology which has limited clinical usefulness. This results in longer stays for animals in rehabilitation and delayed resolution of disease or injury conditions. Currently Mote has an antiquated chemical-based developer which is failing. 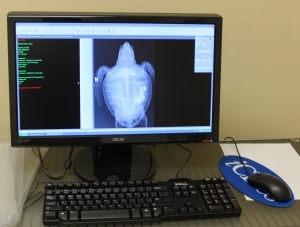 Because of the importance of this diagnostic equipment to sea turtle rehabilitation, we request partial funding to replace the current processor with a Computed Radiography developer. We feel that Mote has historically provided excellent veterinary care to our rehabilitating sea turtles and we would like to continue this quality of care by upgrading our radiology equipment. Since all sea turtles in Florida are threatened or endangered, providing the best veterinary care to each animal admitted to rehabilitation is of great importance to the conservation of Florida’s sea turtles. Results: A CAGFA CR 30X Computerized Radiography machine was purchased and installed.